Stride (Released when both players' vanguards are grade 3 or greater! )-Stride Step-[Choose one or more cards with the sum of their grades being 3 or greater from your hand, and discard them] Stride this card on your (VC) from face down. 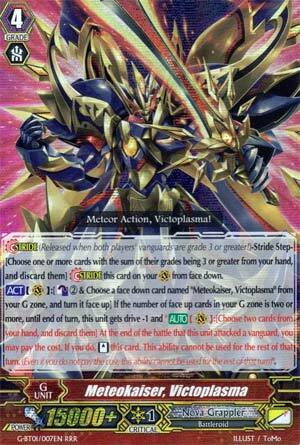 [ACT](VC):[Counter Blast (2) & Choose a face down card named "Meteokaiser, Victoplasma" from your G Zone, and turn it face up] If the number of face up cards in your G Zone is two or more, until end of turn, this unit gets drive-1 and "[AUTO](VC):[Choose two cards from your hand, and discard them] At the end of the battle that this unit attacked a vanguard, you may pay the cost. If you do, [Stand] this unit. This ability cannot be used for the rest of that turn. (Even if you do not pay the cost, this ability cannot be used for the rest of that turn.)" 3rd card of the week is Victoplasma. He packs some mean punch here. Once he's Stridden, for an ACT cost of CB2 and turning a copy of himself in the G-Zone face up, if you now have two face up G-Units there, he loses 1 drive check this turn, but gets to restand after attacking for a cost of 2 card from the hand. Once per turn, anyway. So effectively, how does he break down? Well, you lose out on an Extra Drive Check that turn, so it's -1. You then attack again, forcing a -2 from the opponent at least. +0 wash involved from tossing 2 and then Drive Checking 2 back again. So Victoplasma is basically a CB2 for +1. In theory then, not exactly efficient, but of course this assumes he won't meet a PG to the face. A 26k body means at least 3 cards otherwise just to 2-to-pass this dude, so you really do need to read the opponent's cards well to milk this guy effectively. He's a brutal finish for someone with a small hand, and considering what the new deck can do before then to whittle it down, it sets up very nicely. Victoplasma is not a card to be used recklessly, but he provides a nice finish for those who have little to guard with. Ethics Buster Reverse, when did you get so big? What we have here is a Nova Grappler Persona Flip Stride unit. For a CB2, PF cost, Victoplasma loses one drive check and gets to restand after discarding two cards from the hand after attacking the vanguard. Well, it's... Not bad, not really, it swings in with such big numbers that at the very least the dual twin drive will be hard to stop. At least you don't need to lock two units like Ethics Reverse did. Sadly, this, while scary, really isn't anything new in terms of what we've seen before. And, just watch, near the end of Block 5 there will be a Kagero unit that can do what this does, but better since it won't lose its Trinity Drive.